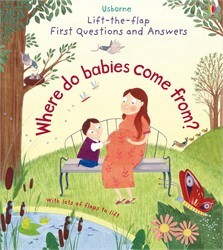 This lift-the-flap book has every question covered, explaining the facts of life to children in preparation for their new brother or sister entering the world. This is a super book and it’s perfect for answering those tricky questions that often leave parents a bit lost for words. The questions surrounding how and why mummy's tummy is getting bigger is a struggle for many parents to answer. This lift-the-flap book has got things covered, explaining the facts of life to younger children in preparation for baby entering the world. answered without making the subject too scary or complex. A book which answers kids’ questions in the most delightful and inventive way... The facts of life made fun and fascinating.